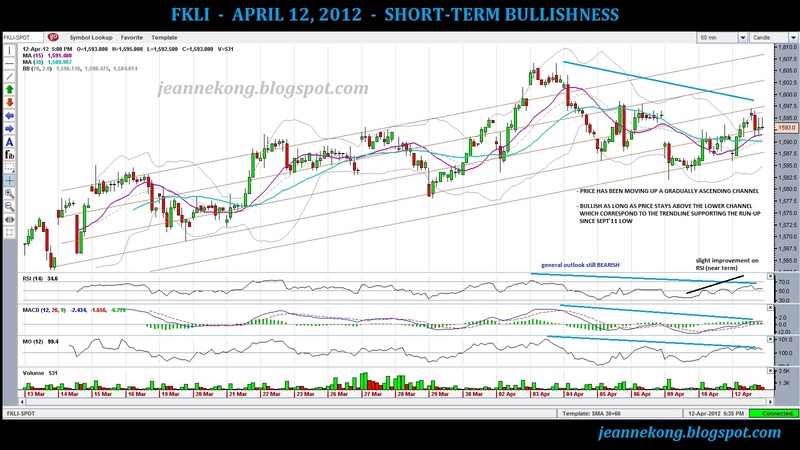 Did some research on the FKLI yesterday after market close. Just managed to post it up now. 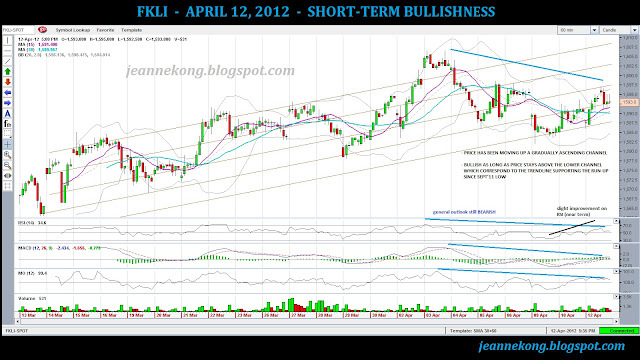 I was expecting some short-term bullishness on the index future after my analysis. This is well-boosted by the over 15 surge in the US & Europe main markets yesterday night. Though riding on an ascending channel, still there are very mild buying due to the fact that index is already at historical high, & price-momentum divergence is getting more & more obvious, almost like replaying the Jul'11 peak itself. Also, there is none fresh catalyst to boost sentiment except the long-awaited announcement on dissolving of the Parliament & GE-14. Regional side, we just saw the worst Non-Farm Payroll (NFP) figure for CY2012, created a mere 120K jobs in March'12. While last night saw jobless claims jumped to a high of 380K, right below the 400K mark which was successfully broken late last year since the economy started to bottom out. Check out the US market on the MarketWatch. "...Unemployment Rate: 8.2% March. Non Farm Payroll: 120,000 Mortgage Rates Average:30 Year - 3.88% 15 year - 3.11% Retail Sales Dec.: 0.1%Manufacturing Index Dec: 53.9 Consumer Confidence Index Dec: 64.5 GDP Q4: 2.8%...Last update: 4/12/12.."
Local side, we shall see the index climb slowly, despite on low momentum, right till the GE announcement is released. After which, the optimism boost factor will fade & shall be replaced with cautious stance & selling on political uncertainty. 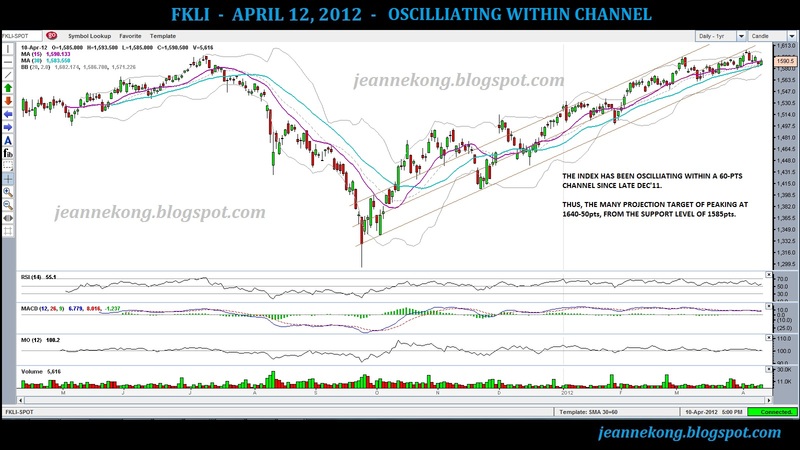 That moment shall see the momentum divergence take its toll to correct overbought price level. Foreign funds flowing out will be obvious by then. Nevertheless, keep riding on the GE optimism, at least until we see trading volume spike again on fund actions. 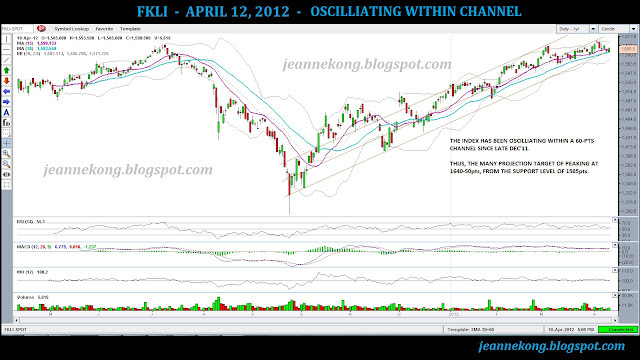 Read on my take on KLCI 1H'12 outlook posted earlier in the year.